Cambridge Christian School enriches students’ imaginations through an extensive fine arts program that offers classes in vocal and instrumental music, theatre and visual arts. These classes seek to add dimension to the talent and skill base of our students, providing them the opportunity to explore their artistic talent while learning the fundamentals. Cambridge Christian School is a supportive environment for students who have yet to discover their “artistic flair” and for those who simply want to try something new. Opportunities to perform for their peers and community abound. The annual school talent show features individual talent for students in Kindergarten through 12th Grade. Each spring, Upper School students stage a major Broadway musical that showcases vocal, dramatic and orchestral performances, as well as extensive staging, set design and choreography. 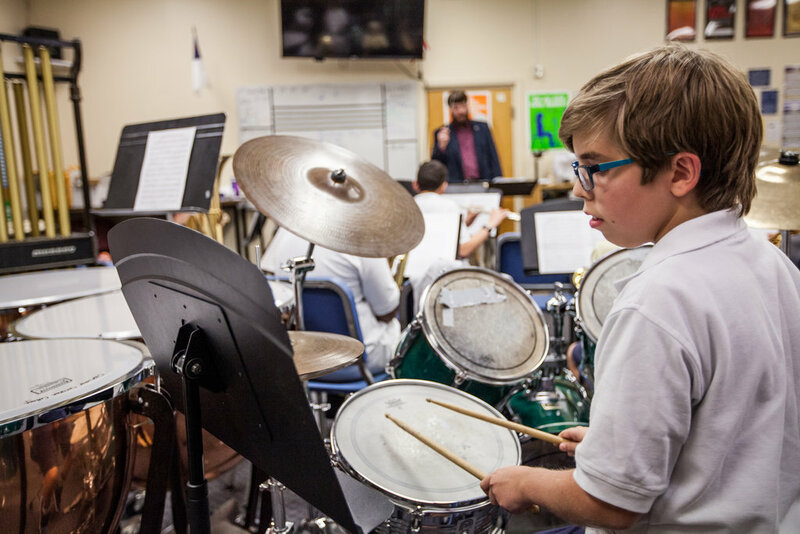 Explore our award-winning Fine Arts Programs below! Choral opportunities in the High School include the High School Choir, a Women’s Choir, a Men’s Choir, an auditioned Concert Choir, and an auditioned Mixed Ensemble Choir. Concerts occur throughout the year, showcasing the talent of our students. During Spring Break, the High School Choir tours a Caribbean location, combining singing with a mission outreach. Past destinations have included Puerto Rico, Grenada, and the Cayman Islands. Southeastern tours of the United States have also been taken. High School students also have the opportunity to participate in the annual musical. 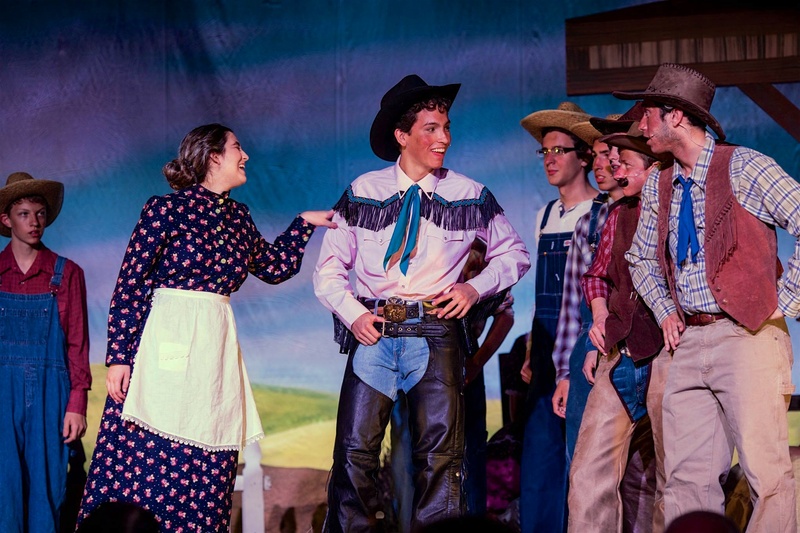 The spring musical’s obvious stars are those out front – students who labor at memorizing countless lines and songs. Hidden talents surface, and one has an opportunity to see the “whole student” emerge. Many parents and friends of Cambridge Christian School play alongside students in the musical’s live orchestra. Vital to the success of the spring musical is the participation of the many students who work behind the scenes – whether it be designing costumes, designing and constructing sets, gathering props, or publicizing the musical. The Middle School Choir is comprised of students in the 7th and 8th Grades. These students meet five times a week under the guidance of a vocal instructor. The Middle School Choir has performed at Disney World, Universal Studios, and Tampa Bay Mall, and has participated in District competitions for Hillsborough County Choirs. It regularly performs in the Secondary School chapel services and at nursing homes. Additionally, there are evening concerts here at the school in which students can shine in front of Cambridge Christian School parents and friends. Individual members of this choir have participated in the District Solo competition and have qualified for All States Festival competitions held at the Performing Arts Center in Tampa. Lower School students are introduced to the fine arts through weekly music classes and participation in choral, band and hand bell electives. A yearly international mission trip for Upper School choir students provides the opportunity to minister to those from other cultures using choral, instrumental and dance presentations. Lower School students minister to senior citizens through choral performances at retirement homes and at an annual grandparents day. All Lower School students participate in gift-gathering and vocal performances at the Christmas musical. Students also perform throughout the community in churches, schools and shopping centers. Students in High School have the opportunity to join the High School Concert Band and Pep Band. The band plays exciting pep tunes at all home varsityfootball games. Band members benefit from avariety of performance opportunities and venues. Students master all 12 major scales throughout the year and build an eclectic repertoire of manygenres and styles. Individual students are challenged to participate in district level and state-wide competitions as well as play in the pit orchestra for our annual Spring Musical. 7th and 8th Graders have the opportunity to participate in the Middle SchoolConcert Band and Pep Band. At times, this band performs as their own group, combined with the 6th grade band, orcombined with the High School Concert Band. Individual students are encouraged to participate in district level competitions. Students enjoy an end-of-year performance at Disney Springs. Lower School students are introduced to band in the 4th grade. Students go through an instrument assessment process to help guide them in choosing an instrument. The lower school bands learn the basics ofinstrumental technique and music reading through a comprehensive methods book. They perform inthe Team Day Opening Ceremony, Grandparents Day, the Christmas Concert, and the Spring Concert. Lower School students minister to senior citizensat our annual grandparents day. Students also perform throughout the community in churches, schools, and shopping centers. The Drama program at Cambridge Christian School offers classes for Middle and High School students. It is our belief at Cambridge Christian that each talent we have, whether academic, athletic or artistic, is a gift from God. As good stewards, it is our responsibility to multiply these gifts and to use them to glorify our Lord and Savior, Jesus Christ. Drama classes at Cambridge enable and equip our students to achieve that goal. Middle School students can select the Drama Elective and be introduced to the basic principles of the art, including teamwork, body and movement, spontaneity, give and take, and character development. Each quarter, in addition to practicing in class, the students have the opportunity to present an evangelical drama in Middle School chapel. This exposure enables students to make a more informed decision regarding their high school course work and artistic direction. In High School, through improvisation, vignettes and intense study, our students strengthen their acting muscles and deepen their understanding of performing for “an audience of One”. Drama is regularly used in High School chapel for sermon support, evangelizing and glorifying God. Students are encouraged to focus on their spiritual and artistic development as they prepare to meet the challenges of the secular world of the arts. Each fall a full-length evangelical drama is presented with the objective of sharing the Gospel and changing lives. In the future, we also anticipate local outreach and a mission trip. We are looking forward to what God has planned for the talented actors at Cambridge Christian School. 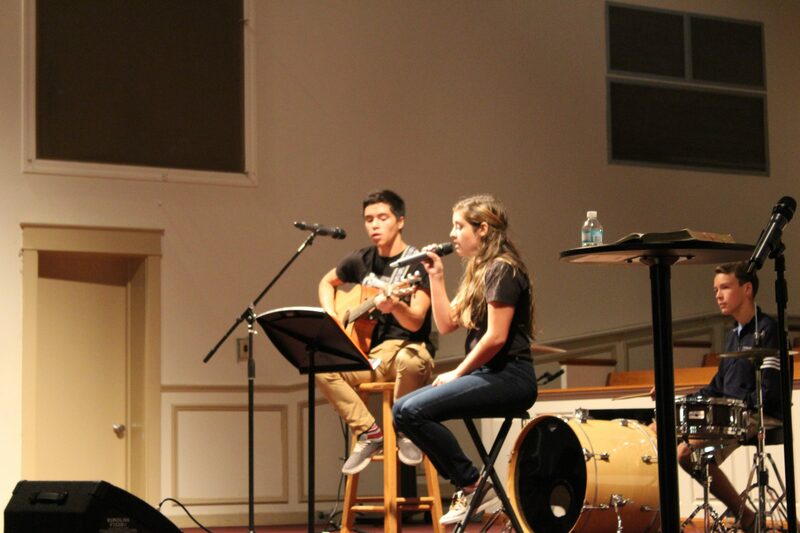 The Fine Arts department encourages and nurtures students to glorify God through their creative endeavors. Art classes are offered at all grade levels and emphasize individual style while incorporating the study of artists, history, media and art techniques. Our on-site kiln provides students the unusual opportunity to do various ceramic projects yearly. Each year, our student work wins awards at local, state and international exhibits. 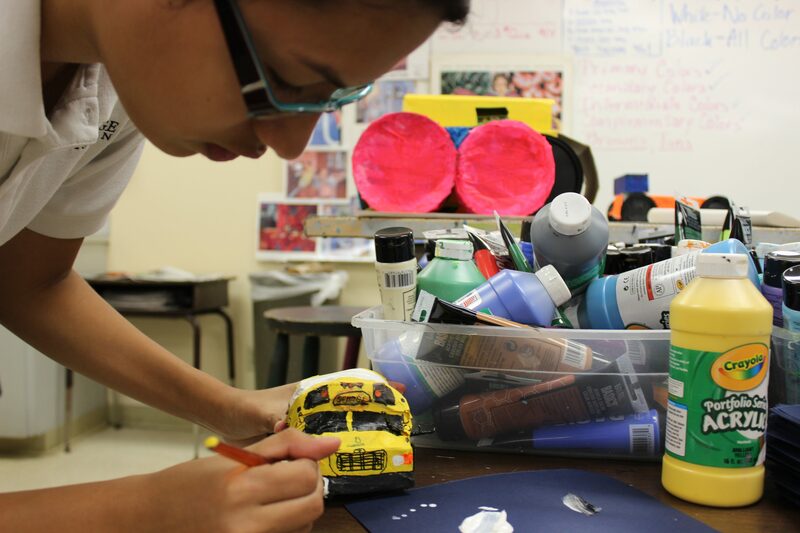 Students produce some amazing artistic creations in a wide variety of media, including pencils, watercolor, oils, tempera, chalk, paper collage, and sculpture. Students study the history of art and the works of period and trend-setting artists, and they experiment with different styles of their own. Many enter competitive art shows, and their art work decorates many areas on campus in the form of murals and sculptures. Many people ask how they can support Cambridge Fine Arts in addition to their attendance at performances. The biggest way you can help is by becoming one of our Fine Arts Patrons by supporting our events financially. Much work goes into making these shows possible – professional sound, professional lighting, costumes, sets, make-up, props, a live orchestra for our spring musicals – all of these have been made possible in the past by generous financial giving and can only continue happening with continued financial support. We are grateful to our Fine Arts Patrons because without them we could not put on these productions! Become a Lancer Fine Arts Patron Today!